Can you believe how time flies? 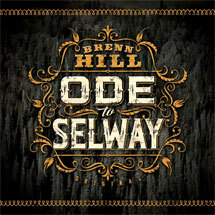 Announcing the new release from singer/songwriter Brenn Hill, Red Cliffs Press is proud to present a collection of music that honors the great Selway Wilderness and beyond. Featuring twelve all-new, all-original songs and a cover of legendary Ian Tyson’s “Fifty Years Ago,” ODE TO SELWAY marks another milestone for an artist that continues to pay homage to life and love in the Rocky Mountain West. Alongside veteran producer and multi-instrumentalist Jonathan Yudkin, Brenn hits full artistic stride with lyrics and melodies that weave deep emotion and cinematic western imagery with instrumentation provided by a collection of award-winning studio masters. The live essence of an intimate singer/songwriter performance is captured in multiple cuts with Brenn playing and singing on “Blacktail Butte” and the Waddie Mitchell collaboration “Rawhide Braider”. “A Cowgirl’s Goodbye” is a song about a wounded bronc rider left to his perils by the Texas Cowgirl he loved less than rodeo. “Breakway Runaway” is a song about the girls that were born to rope, ride, and long for their loved ones back home. “Salmon River Motel” tells the star-crossed love story of a lonesome Montana buckaroo and a river guide born to the water while “Brianna” pays tribute to the young cowgirl left behind in the wake of family turmoil from substance abuse. Cowboy Poet and buckaroo Waddie Mitchell appears in a second collaborative effort, “Bristlecone Pine”, a poem that he penned for the wounded hearts of war set to music by Brenn. “Angels in this Room” is a song about the team of spirits that rallied to save Hill’s young son Briggs from the clutches of brain and spinal cancer. “The Ones That Changed Our Lives” commemorates the short life of Emily Parker, tragically killed at Newtown in December of 2012.